Being on the losing side of the Hōgen Rebellion in 1156, the courtier Fujiwara no Moronaga was sent to exile on the island of Shikoku. One day in autumn, he wandered around in the countryside and came to Mount Miyagi, which was famous for its forest and waterfall. 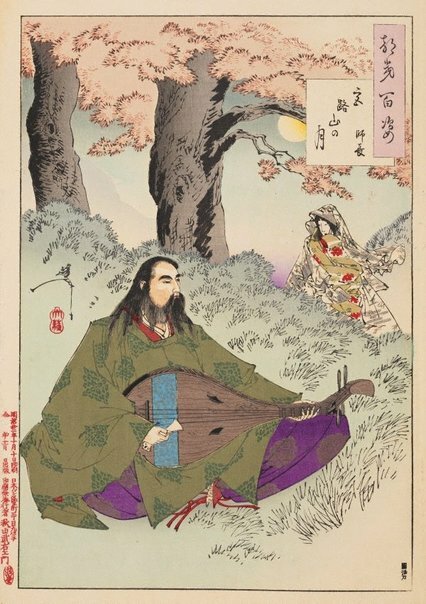 Moved by the sound of the water and the songs of the birds, Moronaga started to play a tune on his 'biwa' (short-necked lute). The music soothed his homesickness. Charmed by his music, 'suijin' (the water goddess) appeared, dressed as a travelling noblewoman.